Of course, the Steinway name needs no introduction; it is synonymous with all that is good in a piano. 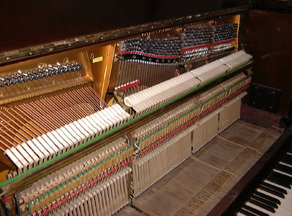 This particular example, a model ‘KP’ upright dating from 1926, is equipped with an electrically operated Aeolian Duo-Art reproducing system in addition to the conventional pedal-operated Pianola action. The picture to the right shows the inside of the upper section, with the player mechanism removed. The piano action visible here has been comprehensively rebuilt, including the replacement of all felts, leathers and springs. The original hammers were totally unserviceable necessitating the provision of a new set. In addition, the instrument has been completely re-strung and the iron frame re-gilded. Complete refinishing of the casework, using entirely traditional French-polishing methods, has resulted in a truly beautiful appearance. Finally, the pneumatic Duo-Art player system has undergone a normal full restoration, within which all rubbercloth, tubing and leather components are renewed, and the system fully regulated. As the final stages restoration were reached, it was difficult to believe that this wonderful piano resided for the last ten years, dismantled, in a garage. Although such adverse conditions had taken their toll, restoration of such a magnificent instrument for our client was entirely worthwhile. “I have recently had my Aeolian Pianola restored by Mike Boyd. He kept me informed of progress throughout the restoration, including photos which was very reassuring and I was confident my instrument was in trusted hands. Having now had an opportunity to play the Pianola and the piano, I am delighted. The sound is brighter and it is so exciting to play Pianola rolls that we have had in the family for years but been unable to use. The whole process for me has been very easy and I would really recommend Mike and his team to care for anyone’s valued piano” Clare Winter, St Albans. “Hello Michael. Well, what can I say? What a superb job you have done on the Steinway (Model K upright, pedal/electric Duo-Art), I can’t believe the difference. It plays everything superbly. I have tested it with a roll that it would never play all the notes, namely ‘Liberace plays Gershwin’, and it was stunning. It is so quiet now, and powerful. Thank you and Trevor for everything”. D Miller, Leeds. “Thank you for all your work. I think the result is spectacular compared to how it was”. M Dearlove, East Sussex. “In 1927 my grandfather purchased a Broadwood Ampico grand piano. My mother and her siblings made great use of this expensive instrument – it cost my grandfather £740. I inherited it from my mother when she died 39 years ago. This piano had been a very happy part of my childhood and I have many fond memories of parties where the piano played a huge role! I was 18 when my mother died and I was certainly not in a position to house this beautiful but cumbersome heirloom. I loaned the piano to two schools over the following 25 years, on the proviso that the Ampico mechanism would not be touched. 14 years ago I was in a position to house the piano, and this is when I found Michael Boyd and our long-term, long-distance relationship began! Last year (2016) I finally took the decision to attempt to have the piano’s mechanism restored; all the pipework and bellows had deteriorated and it hadn’t been used for nearly 40 years. We knew the task was a big one and would take a lot of time and patience on Michael’s part. Michael arranged for his expert and specialist removal company (Morfeys Ltd) to collect the piano, and indeed return it when the work was done. During the following months Michael sent me regular updates and many photos of the piano, sometimes in bits (!). I always had confidence that he would be able to restore the piano back to its former glory, and he did! I would like to share just what an amazing moment it was for me when I played the first roll yesterday afternoon, not having heard the piano for 39 years. The roll I chose was “Rose Marie” and I had many happy tears. Rose Marie was the name of my sister, she died at the age of 40, so this particular roll is extremely significant. The first playing was witnessed by my gorgeous children, Lucy and Sam, my 2 year old grandson, my lovely partner and his parents, as well as a very good friend of ours. It truly was a very special moment and I thank Michael for bringing the piano back to life for me and my family. I know that it will bring us years of pleasure”. Emily, Yorkshire, March 2017. “The instrument (a Weber model 60 upright) is still more in use as a Pianola than a piano (which is not what we had actually intended, as we are piano players!) and that is testament to the fantastic job you did”. Richard H, Yorkshire, June 2017.
husband has had to admit that it looks and sounds like a different creature! With many thanks for a wonderful job”. S Boyes, 2011. “After two family weekends, I just wanted to say how thrilled we all are with the Pianola (a Steinway K upright.) The two generations who were all brought up on the special treat of being allowed on it are so pleased to have it back in such fine working order. Thank you so much for such an excellent job of work. We have also introduced one of the third generation to it, although at 2 years, he was somewhat bemused but did start moving his feet copying his grandfather pedalling”. J Lloyd, Gloucestershire.